NWG Innovation Festival – what’s in store for 2019 Year of Green Action? 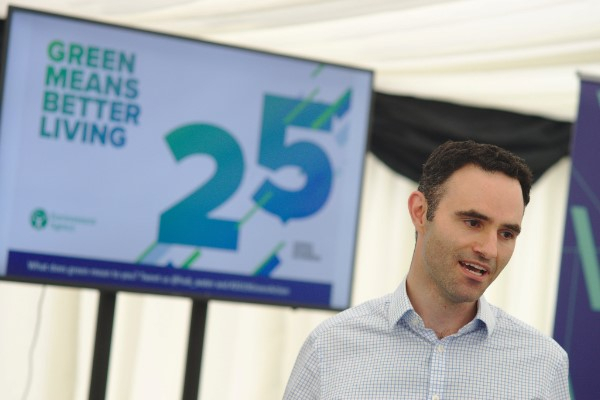 Last week, Northumbrian Water held their 2nd Innovation Festival where businesses, practitioners, regulators, academics and customers explored 13 Grand Challenges that we currently face in the water environment. Northumbrian Water created the perfect environment for open innovation and collaboration and 100’s of creative and inspired ideas were born. The Water Hub ran a 3 day sprint: 2019 Year of Green Action – what nature can do for you and your business? We all want to leave the environment in a better state than we found it and we know that small and medium businesses need to be part of the solution if we are to grow a sustainable northeast economy. This is what we unpacked over the three days with a wonderful group of open, passionate and creative people. We explored the challenge with keynotes from Oliver Harmer (above) – Environment Agency, Claire Thompson – North East England Nature Partnership and our very own Louise Bracken. We were inspired with Flash Talks from Lydia Allen – National Youth Agency, Graham Thrower – Urban Foresight, Leon Baruah – Viridian Logic, Tom Sinclare – Daykin and Storey, Paul Black – Capability North East, Tony Gates – Northumberland National Park, Martha Silcott – Fab Little Bag, Lorna Davis – SuDSPlanter and Adrian Cantle-Jones – Durham County Council. Check out Martha’s poem and Louise and Lorna’s Festival keynote on our YouTube page. We had a couple of unexpected guests join us in our Sprint, BBC Breakfast’s – Steph McGovern and Claire Moriarty – DEFRA’s Permanent Secretary, who came to see how we plan to operationalise the government’s 25-year plan for the environment in the North East of England. So what did we come up with? Green Partners – Achieving multiple benefits through partnership working. This team identified the principle barrier as knowing who is doing what, where, when and what the opportunities are to work together. Out of their thinking, the Green Partners app was born. Green Procurement – creating a competitive advantage for sustainable businesses, products and services. This team set an ambitious long-term goal: in 25 years only sustainable businesses would exist. They identifying the overriding factor in most procurement systems was cost and set a course to redress that balance by creating a procurement system where sustainable businesses have a competitive advantage. Roots – co-creating places and communities by giving colour ans soul to our un-loved green spaces. This team set a goal for the co-creation of green spaces – matching unloved green spaces with people and communities, and developed an app to facilitate this match-making. Eco Angels of the North – an augmented reality game which partners with Eco-businesses engage children in environmentally responsible behaviours. This team set a goal that environmentally responsible behaviour is our everyday norm, and focused on engaging young people in the conversation. Their augmented reality game used gamification, quizzes, incentives and rewards to educate and encourage environmentally responsible behaviour. Our goal at The Water Hub was to use the Innovation Festival to spark ideas for how we can celebrate 2019 the Year of Green Action in the North East. We will be taking forward some of these concepts and others emerging from the embers in the coming weeks. Watch this space for more information!